The monument to Richard Sackvile consists of a niche tomb under a very depressed Tudor arch, the moulded front of which is a modern restoration. In the centre of the back is a representation of the Trinity. The Father, vested, supports the Son, naked save for a loincloth. The mutilation of the heads of these two figures has practically destroyed the Holy Ghost. West of this Richard Sackvile, in furred gown, kneels at a faldstool, with one son similarly dressed behind him; east of it his wife Elizabeth, in kennel head-dress, mantle, and kirtle, kneels at a similar faldstool, with one daughter similarly dressed behind her. According to the Sarum rite, three Hosts were consecrated on Maundy Thursday. One Host was then deposited, with the Cross, in the Easter Sepulchre. These were restored to the Altar on Good Friday when, after the Mass of the pre-sanctified, followed by Vespers, they were returned to the Easter Sepulchre, which was thereupon watched with lighted candles until Easter morning. On that day, before Mass and before the ringing of the bells, the Host was carried back to the Altar. Then they took out the Cross of the Sepulchre and to the hymn of Christus resurgens, there was a procession to the Presbytery and the Cross was put once again in its usual place. The Easter Sepulchre was generally only a wooden erection, which was placed in a recess or on a tomb. The arched recess was generally in the north wall of the chancel. 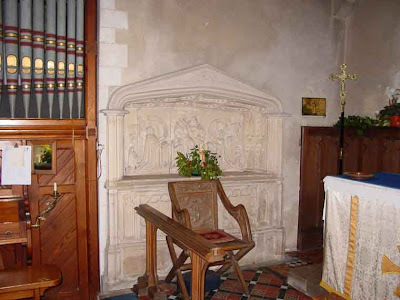 Later, benefactors had tombs built in the north wall of the chancel to serve as holders of the Easter sepulchre. These tombs are often loosely referred to as "Easter sepulchres". "Holy Week, the period from Palm Sunday to Easter Day, constituted the heart of the medieval church`s year, just as the Passion of Christ, solemnly commemorated there, lay at the heart of late medieval Christianity... Expressing to the full as it did the late medieval sense of the pathos of the Passion, the Sepulchre and its ceremonies were also the principal vehicle for the Easter proclamation of the Resurrection." The Easter Sepulchre ceremony was abolished at the Reformation. Don`t Panic ! Don`t Panic ! "The Bones of Augustine "
Synopsis of Pope's Book: "Jesus of Nazareth"